It was a busy week and I didn't manage to get a workout in before Friday. My Friday schedule was jammed with meetings from 9:00 to 5:30, so I needed to get my run done fairly early. I worked from home on that day and was lucky that I didn't have to do my long commute in falling snow. But outside conditions were slippery, making the treadmill my only option for running. No surprise to anyone, I found Friday's run almost unbearable and was determined to get outdoors the next day. The snow on the roads had melted, but conditions were still pretty rough. The local news station showed a temperature of 30°, so I dressed for moderate cold. It was sunny when I stepped outside and I was concerned that I'd overdressed. A few minutes later I was wishing for another layer. The moment I turned the first corner on my run, I was hit with a blast of numbingly cold air that gave me an instant sinus headache. I quickly thought through my intended route to determine whether I should change streets to minimize the wind. 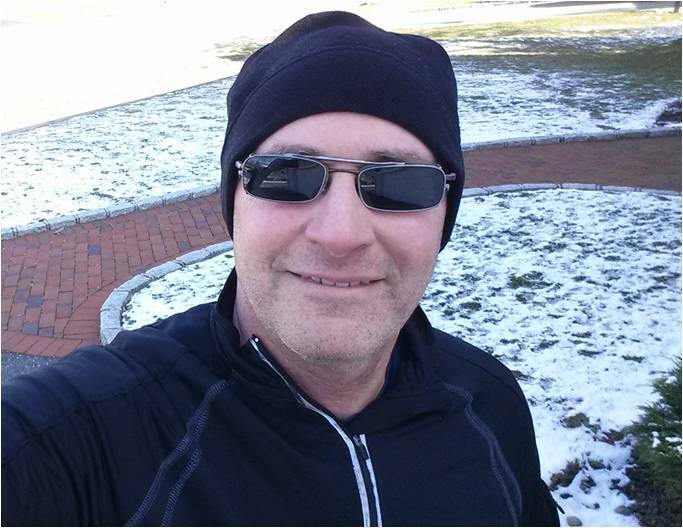 By the time I'd reached my first mile, I'd heated up enough to manage through the cold. It was a low performance run overall, but I managed to get through my miles and I didn't get bit once. I usually reserve my longest run of the week for Sunday, but this morning I had a serious motivation problem. None of my favorite venues seemed appealing (Neighborhood: ho hum, Bethpage: too many hills, Stillwell: too many mountain bikers) and I wasn't going near the treadmill again. My wife suggested the track and I couldn't find an argument against that. So off I went. Although running around the track can be viewed as monotonous, I find it much much more pleasant than the treadmill. At least the track provides sensory stimulation through forward movement. On top of that, I always encounter a different cast of characters as I circle the Tartan track. By the end, I've usually monitored their workouts and made up names for each of them. This morning, it was just me and walking man, a big middle aged guy who was wearing air buds but no hat or gloves. Walking man and I were soon joined by high school running girl who eventually lapped me. But while high school girl had speed, I had endurance, and I noticed her slowing down and eventually talking walk breaks. So I won. Walking man started running, slower than me if that is actually possible. A young guy also joined us, running his laps pretty fast. I did my first two miles going in the traditional counter-clockwise direction and then did two more clockwise, allowing me to see the faces of the other runners. Most importantly, running that way prevented the humiliation of being lapped by young running man and a young running couple who came by a little later. I did manage to lap the walking-to-running man and a bunch of miscellaneous walkers who'd also come by. I did a little more than 16 laps and focused on my shortened stride which I'd hoped would enable a higher cadence. It did not, and the end result was an unprintably slow pace. That is, except for the last lap where I said "screw it" and ran about a 9:15. That was when I lapped walking-to-running man. So, this week it's been three very different runs with the common theme of low performance. I don't really care about that, but I sometimes feel guilty for not going out with the, "All you need is all you got" attitude that I had a couple of years ago. I'm really going to try for four workouts this week and may even stretch it to five if my schedule isn't as insane as last week's. I wonder what these random people refer to you as: Judgmental Man? Mental Man? Creepy, Staring Man? Inappropriately Dressed Man? Yes, yes, YES, yes, yes and Slow Running Man.